'Supreme authority of the return march' reiterates desire to destroy any chance US has of brokering peace deal. The 'supreme national authority of the return march' and the breaking of the siege in Gaza' announced Wednesday the relocation of the protest tent city 50 meters, bringing it closer to the border fence with Israel, the al Resalah Arabic news site reported. The council stated that the relocation of the tent city would serve "as a continuation of the national program of the return marches and the breaking of the siege. [It is] a message of determination from our people to the world around us to move forward towards its legitimate and permanent objectives. We declare that the camps of return are 50 meters ahead as a first step." The council further stated that the purpose of the move was to end the "conspiracy" create an "alternate Palestinian homeland," to express Hamas' resistance to the Trump Administration's 'deal of the century,' and to "end the unjust Zionist siege on our people." The mass protests began on March 30, the first day of Passover. 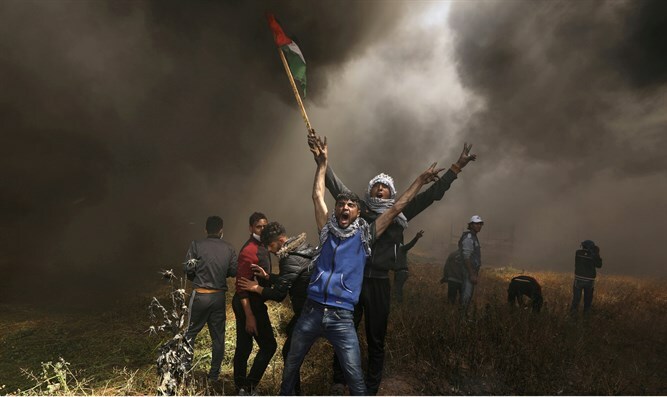 The protests turned violent, and terrorists belonging to Hamas and other terrorist organizations in Gaza threw firebombs and stones and attempted to breach the fence. 17 people were killed by IDF fire on the first day of the protest, the majority of whom were confirmed to be active members of terrorist organizations. Prior to the protests, the IDF called on Gazan families not to come within 300 meters (985 feet) of the fence during the demonstrations, warning that "whoever comes near will put himself at risk." The Gaza Strip is ruled by the Hamas terrorist organization.